FOR THE COMPLETE MANTLE COLLECTION! 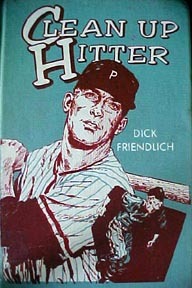 SUBJECT OF 12 PAGE FEATURE IN THE NEW BOOK BY RICHARD WOLFE, "FOR YANKEE FANS ONLY! VOLUME 2. 1974 Mickey Mantle Syracuse Chiefs Baseball Card- Very rare- $200 & Syracuse Chief 4x6- $100. 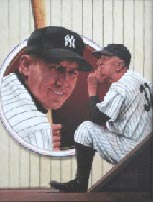 Various hard to find Mickey Mantle postcards including McCarthy, Brace, Rowe, Sarno & more. Email for prices. 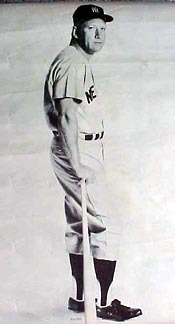 1961 Mickey Mantle Away Yankee pants- These road pants were stripped of the embroidered name plate, as often was the case, and were likely sent down to minors. Since name plate has been removed and all that remains are Mantle's name in black marker with the washing and Wilson tags, Mears never did finish the authentication process. 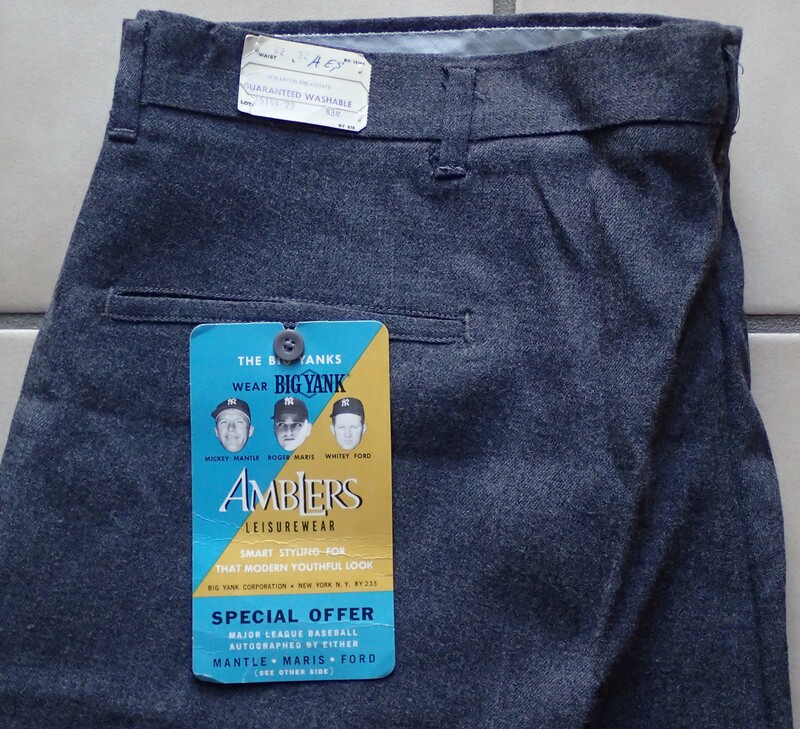 The tagging matches other exemplars from 1961 Yankee road pants that include Bob Turley and Johnny Sain. Pictures available. Selling these as is. $3000. 1961-62 Original Pair of dress pants with Big Yank tag- Mantle,Maris, & Ford- $400 . 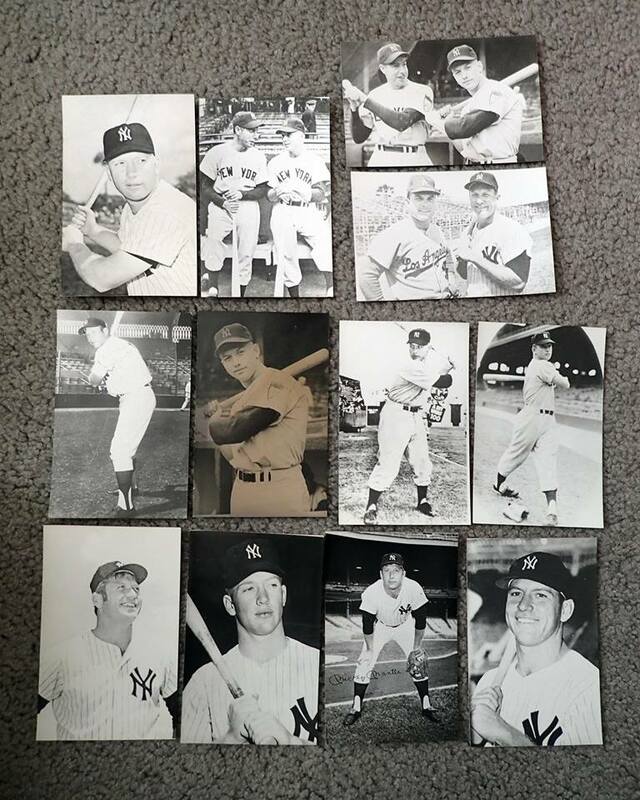 Complete set of 7 different mickey mantle postcards- These are the last and are harder and harder to find. 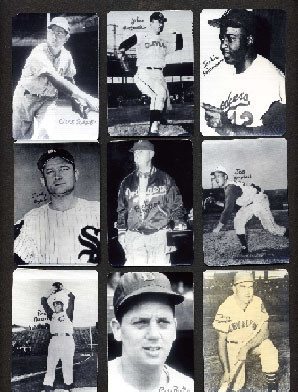 No singles available- The first McCarthy Mantle dates back to 1953 in Detroit.Complete set is $350. 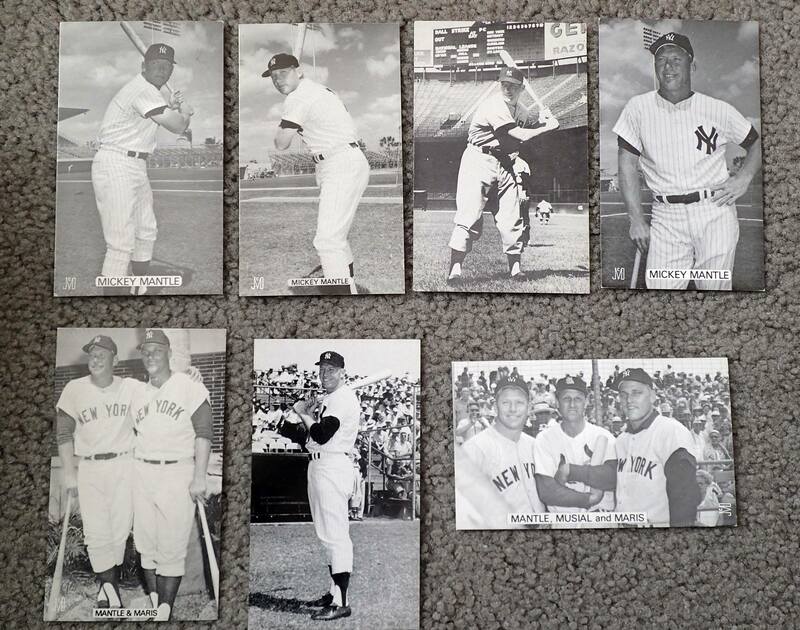 Jim Rowe Mantle postcards- complete set of 12 different mickey mantle postcards- This is my last Rowe set. Complete set is $350. 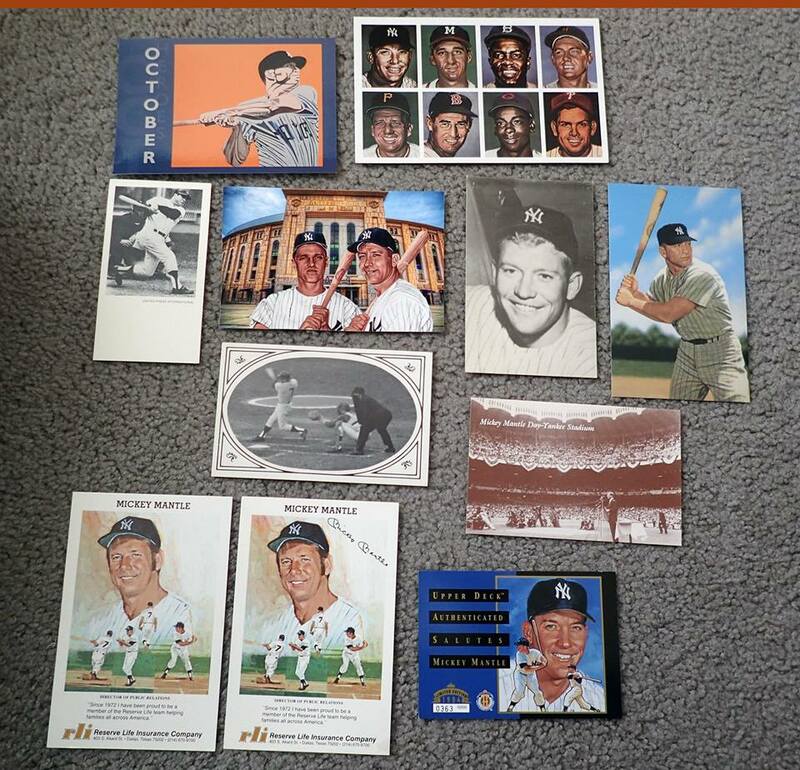 Various Mickey Mantle over sized cards and postcard size issues. email me for individual prices. 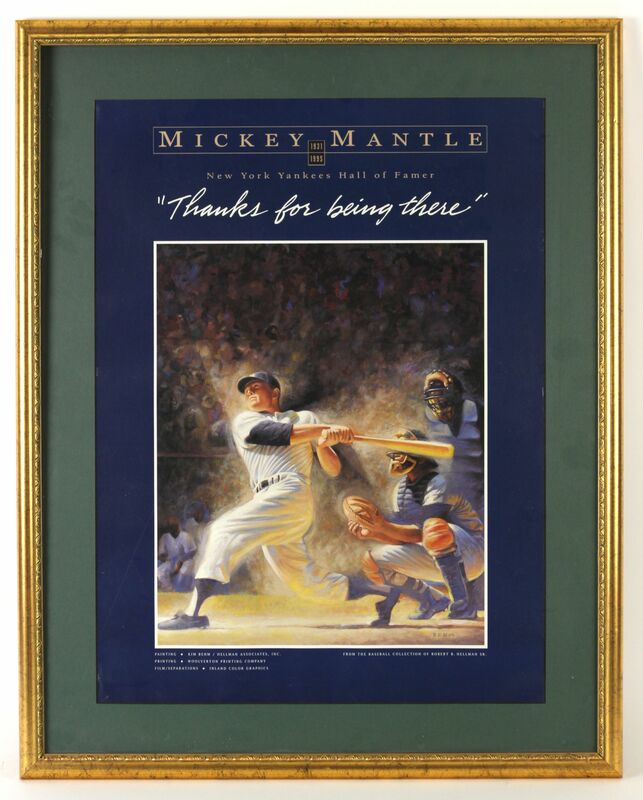 1990'S MICKEY MANTLE WORLD SERIES CANVAS FRAMED 24" X 24"- $450*. 2005 Mickey Mantle HBO hard plastic 4 3/4" x 7"Red Carpet Premiere Neck chain ticket - $50. 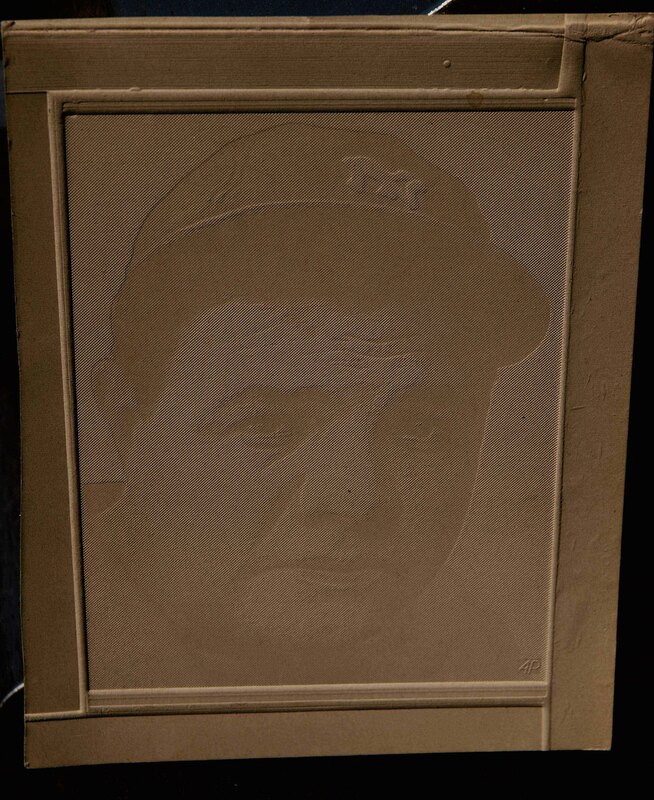 Original Babe Ruth cardboard AP Wood Syndicate printing plate- approx. 6 3/4" x 5"- $150. 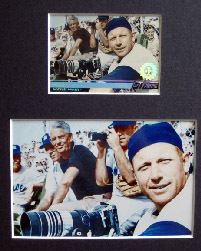 2008 Mickey Mantle 2008 Stadium Club 1ST DAY Card 92- matted with the Topps card and 3G digital photo and original b&w wirephoto from 1962. - $175. 1990 16X20 FRAMED LITHOGRAPHED SINGED BY ARTIST, "FOLLOW THROUGH SWING. "- $295*. 1995 "THANKS FOR BEING THERE." 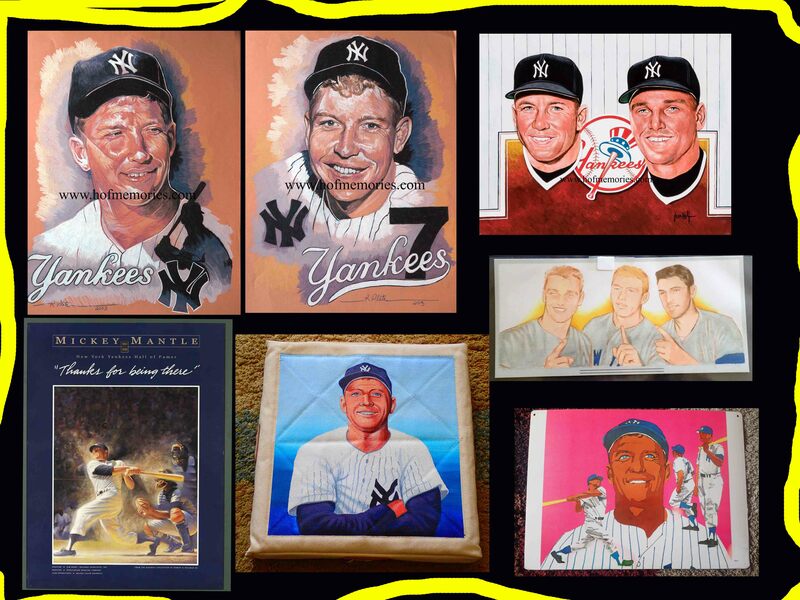 MICKEY MANTLE ART- $175*. VINTAGE 1961 IDEAL TOY COMPANY "DOUBLE EXPOSURE" BOARD GAME WITH BABE RUTH, LOU GEHRIG, JFK, ABE LINCOLN, GEORGE WASHINGTON, CLARK GABLE, JACKIE KENNEDY, AND MANY OTHERS. VERY RARE VINTAGE GAME IN VG++ CONDITION.- $275. 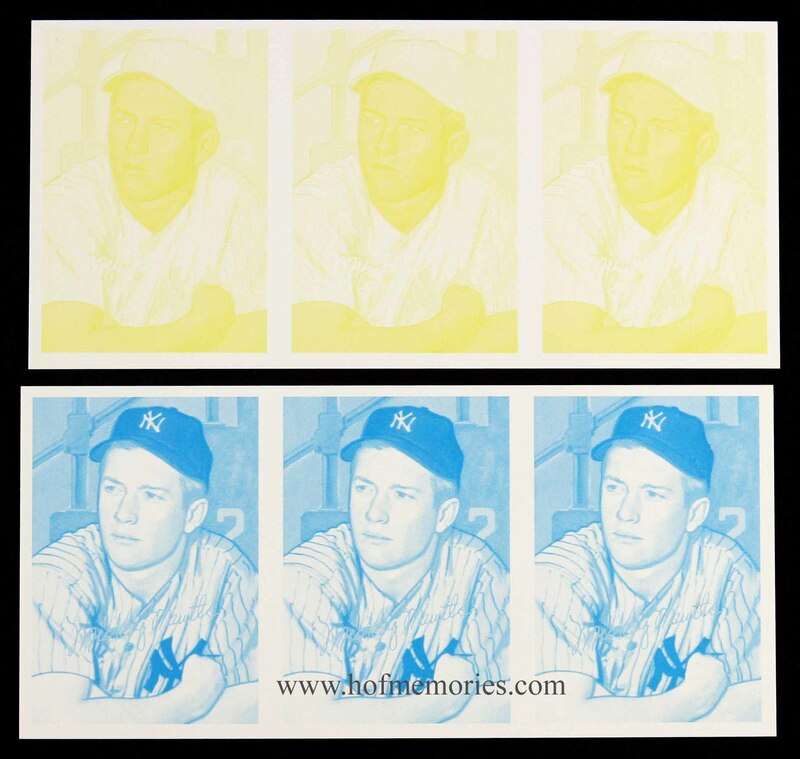 MICKEY MANTLE 3 CARD PROOF SHEETS OF 1951 BOWMAN COMMEMMORATIVE CARD- 2 STRIPS with Topps Vault certificate. Blank backed- $200. 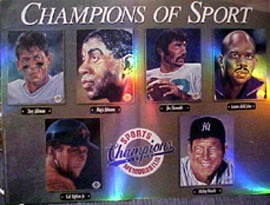 1986 UNCUT SHEET OF 12 SPORTSFLIX- $150. 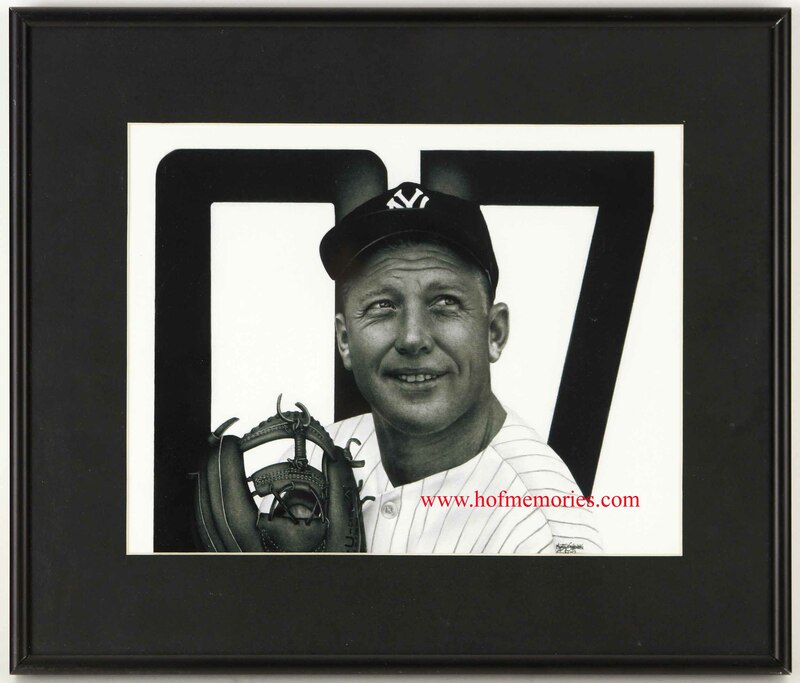 Mickey Mantle 12 x14 ART PRINT-$125. 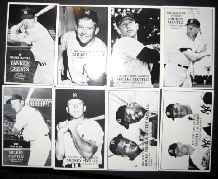 RARE BLACK AND WHITE NORMAN PAULSON POSTCARDS FROM 1950'S TO 1960'S- BABE RUTH-$50, BOB UEKER w TOMMY AARON-$35. 1955 Tour of Japan magazine loaded with Mantle pictures and other Yankees. $75 or best offer. Some splitting of binding. VERY RARE, POSSIBLY ONE OF A KIND MICKEY MANTLE ERROR REDEMPTION CARD #7 OF THE MICKEY MANTLE 7TH GAME SHOEBOX COLLECTION. THIS WAS THE SHORTPRINT NEEDED TO SEND IN FOR THE $700 AND $7000 MANTLE PHONE CARDS. THIS NUMBER 7 CARD LACKS THE BLUE FOIL ON MICKEY'S SIGNATURE AND HIS NUMBER 7. A TRUE RARITY- $150. 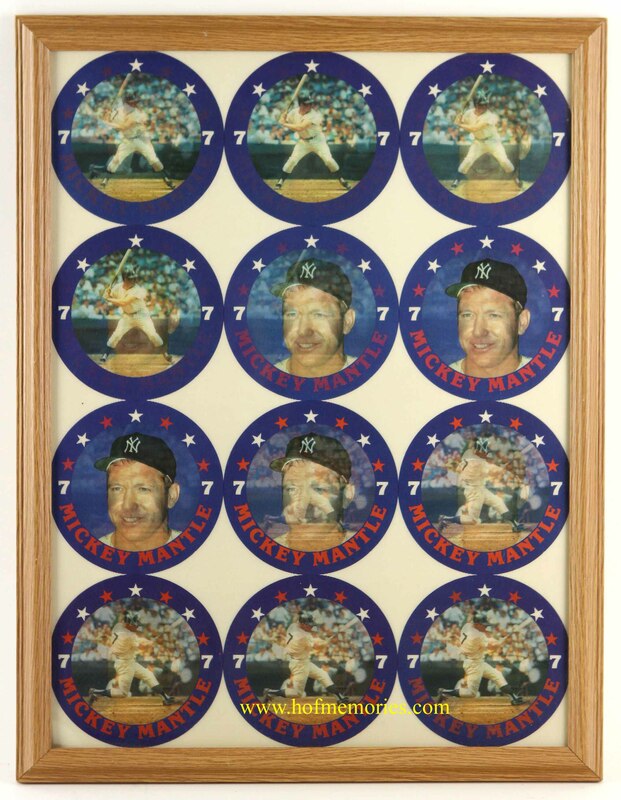 1997 Kodak MICKEY MANTLE 500th homerun lenticular motion 3-D proof uncut sheet 15" x 19"-$150. Original 1964 Art prints- "The Five Immortals" by Robert Riger published by Sports Illustrated. Babe Ruth 7 1/2" x 15"-sold Red Grange 10 3/4" x 11 3/4-$100,"Jack Dempsey 11" x 14-$100,"Bobby Jones 9 1/2"x 14,"-$100 & Bill Tilden 9 1/2" x 14"-$100. 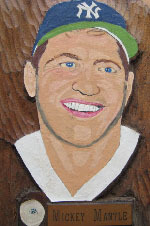 1970 MICKEY MANTLE "PORTRAITS AND PROFILES" CARDBOARD STANDUP DISPLAY PIECE. VERY RARE- VG- CORNERS SHOW WEAR and IS MUCH MORE EYE APPEALING THAN ONE LISTED BELOW. WILL LOOK GREAT FRAMED. APPROX 19 1/2" X 13 1/2'. $200 . 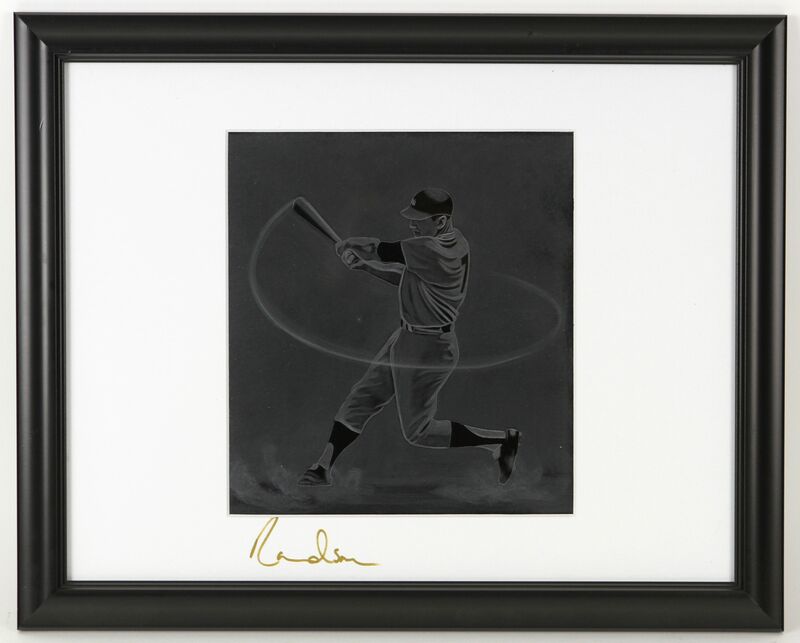 1961 ROGER MARIS ROBERT RIGER ART PRINT- FRAMED AND MATTED. 20 1/2" x 12 1/2".- $135. 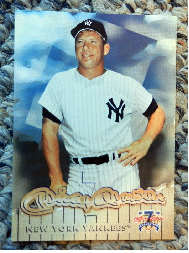 MICKEY MANTLE UPPER DECK MASTER CARD ISSUED IN THE EARLY 1990'S- VERY RARE ISSUE-$95. 1970 MICKEY MANTLE "PORTRAITS AND PROFILES" CARDBOARD STANDUP DISPLAY - THIS IS IN POOR CONDITION DUE TO LOWER RIGHT CORNER DAMAGE. WOULD FRAME AND LOOK RATHER NICE- $150. 1975 MICKEY MANTLE, ROBERTO CLEMENTE, AND TOM SEAVER 13 X 18 INSTRUCTIONAL AIDS. 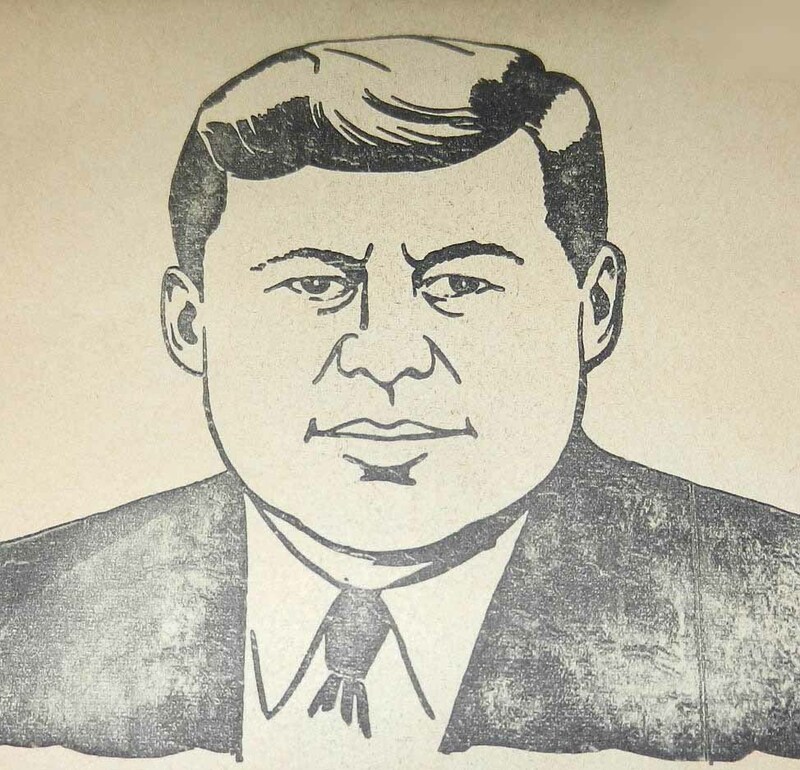 THESE CARDBOARD ILLUSTRATIONS WERE MADE FOR USE IN THE CLASSROOM IN 1975- VERY RARE ITEMS. 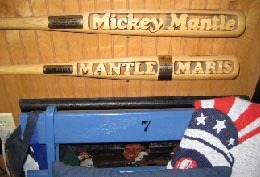 MANTLE -$350(SOLD), CLEMENTE-$150, TOM SEAVER-sold. FULL WRITE-UP ON THE BACK OF EACH. SOME SMALL SURFACE CREASING THAT IS HARD TO DETECT. 1960's BOOK COVERS IN EX CONDITION- 100% ORIGINAL: FRANK ROBINSON- $35, AL KALINE-$35, WARREN SPAHN-$35. POSTAGE IS $5. MICKEY MANTLE DAY JUNE 8, 1969 PROGRAM AND BUTTON- $125, BLOCK OF 10 MICKEY MANTLE YANKEE LEGENDS STAMP-RARE-$50, SPECIAL SAFE AT HOME "SH-PUB-1" 8 X 10 FILE GLOSSY-* THIS HAS SPECIAL "PUB" FOR PUBLICITY DESIGNATION- VERY RARE ISSUE OF MANTLE, MARIS, AND PRODUCTION CREW- $125, 1965 YANKEE PROGRAM WITH ROGER MARIS PAGE- MANTLE ALSO APPEARS INSIDE WITH MARIS TRESH-$40. 1958 TED WILLIAMS ILLUSTRATED CURRENT SIGNING HIS CONTRACT-$75, MAY 12, 1991 TED WILLIAMS COMMEMMORATIVE FOLDER FROM FENWAY PARK-$40. BOTH FOR $100. 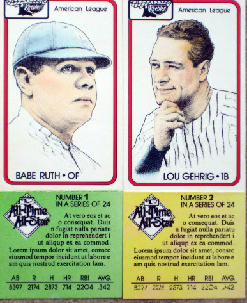 BABE RUTH AND LOU GEHRIG PROTOTYPE KEEBLER COOKIES ALL TIME ALL-STAR CARDS- NEVER ISSUED- NEAR MINT CONDITION- BOTH MEASURE APPROX. 1 7/8" X 4 5/8," FRONTS ARE WRITTEN IN SPANISH.- $150 EACH. 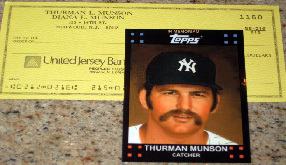 THURMAN MUNSON LOT OF 2: THURMAN MUNSON UNUSED PERSONAL CHECK w THURMAN AND DIANE'S NAMES FROM JERSEY HOME- COMES WITH COPY OF LETTER FROM DIANA MUNSON/ HUNT AUCTION. 100% ORIGINAL. 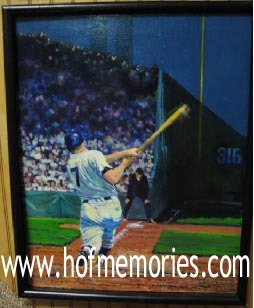 ALSO INCLUDED IS TOPPS IN MEMORIAM CARD (TOMMY MCDONALD MUNSON PAINTING) BOTH ITEMS- $175. ORIGINAL NUMBER 7 YANKEE STADIUM SEAT BACKING (1923- 2008). SEAT HAS YANKEE STADIUM AFFIXED EMBLEM WITH THE NUMBER 7 SEAT RIVETED IN THE UPPER RIGHT CORNER. SEAT COMES FROM LOGE BOX MVP SECTION 13- $350. DEREK JETER 13" X 18" PETER MAX PHOTO ART WITH BLAZING COLORS- SOLD IN PETER MAX STORE IN YANKEE STADIUM IN 2009- 100% ORIGINAL- $125. PRINT IS CRYSTAL CLEAR AND STANDS OUT. A NICE FOCAL POINT. THIS MICKEY MANTLE SIGNATURE IS A NICE BOLD CUT SIGNATURE IN BLUE BALL POINT PEN- SIGNED TO ERIC, BEST WISHES, MICKEY MANTLE. COULD ALSO BE CUT INTO A 5" X 2" MOUNTED SIGNTURE.- GUARANTEED FOR LIFE- 100% AUTHENTIC- $215. 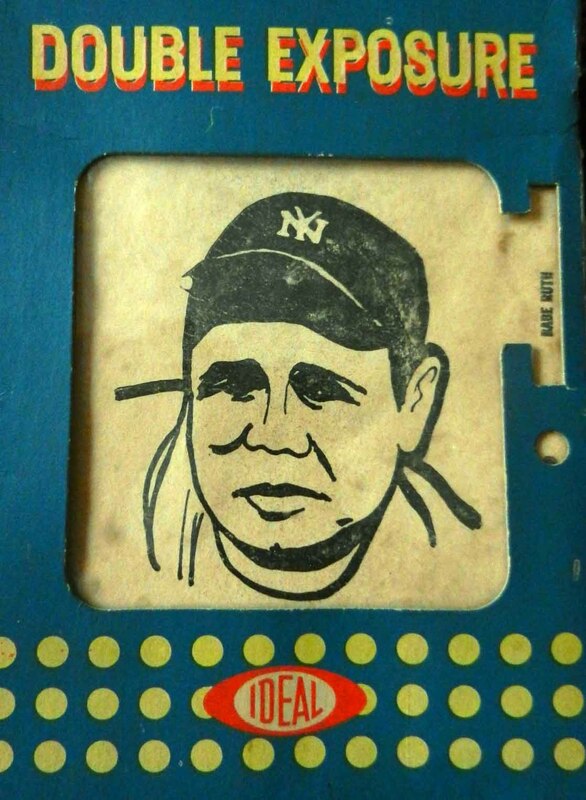 BABE RUTH Pinball Arcade Game Cabinet Sideart- a beautiful 17.5" x 25.5" display piece from a rare arcade trivia game made by Greyhound in 1992. $295 + postage. 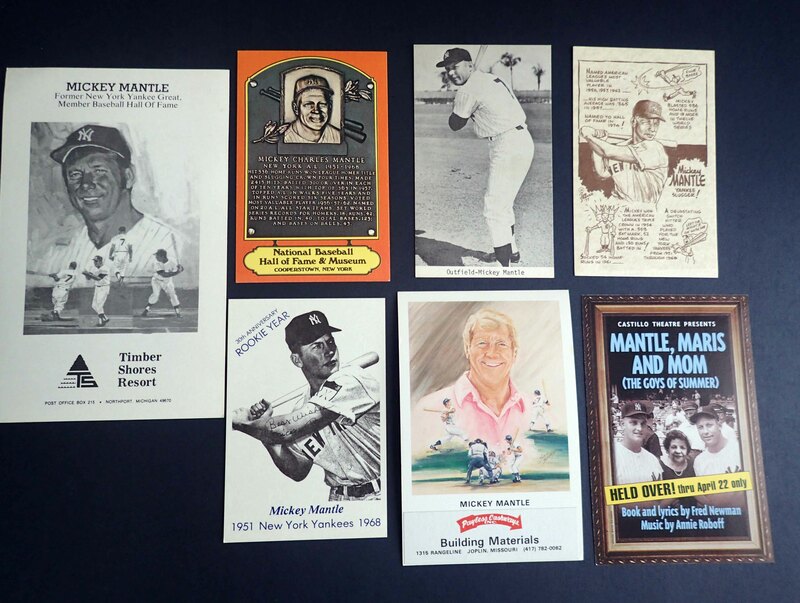 THE RAREST TCMA SET WITH MICKEY MANTLE- COMPLETE SET OF 1975 HOF MINI BLUE TINTED SET WITH MICKEY MANTLE,2 DIFF BABE RUTH CARDS, LOU GEHRIG, WHITEY FORD, JACKIE ROBINSON, TY COBB, JIMMY FOXX, CONLAN, DUFFY, FABE, RICE, RADBORN, GRIMES, KINER, HUGGINS, IRVIN, HERMAN, HARRIS, GROVE, AVERILL, BOTTOMLEY, BOUDREAU, LANDIS, MEDWICK, ROBINSON, SISLER, SPEAKER,YOUNGS, McCARTHY, AND WHEAT. VERY RARE- EXCELLENT CONDITION. THE MANTLE IS SUPER RARE- $225 FOR THE SET. Cards are 2 1/2" x 3 1/2". LOT OF (5) 8 X 10 ROBERT RIGER "THE CHAMPION" ISSUES. THESE ARE 100% ORIGNAL FROM 1954- 1961. TED WILLIAMS, TONY TRABERT, FLOYD PATTERSON, LITTLE LEAGUE PLAYER, AND EDDIE ARCARO. OVERALL CONDIITON IS GOOD TO VERY GOOD. SOME HAVE BEEN TRIMMED SLIGHTLY TO 8 X 10 BY ORIGINAL OWNER. THE KEY IS THE WILLIAMS.- ENTIRE LOT IS $75. 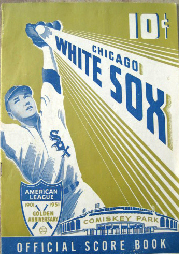 1951 YANKEES VS WHITE SOX PROGRAM- THIS IS ONE OF MICKEY'S FIRST GAMES AS A YANKEE. HE HAS NOT YET BEEN ASSIGNED A NUMBER, WHICH WILL BE NUMBER 6. THIS PROGRAM HAS DIMAGGIO #5, CLIFF MAPES #7, AND NO NUMBER DESIGNATED FOR THE NEW KID FROM COMMERCE. VERY RARE PROGRAM. $175. 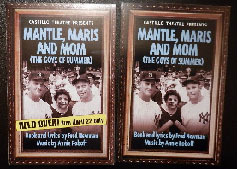 OFF OFF BROADWAY PLAY POSTCARD- MANTLE, MARIS, AND MOM- PROMOTIONAL POSTCARD-$35 each. 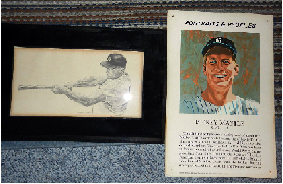 ORIGINAL ART OF MICKEY MANTLE, ROGER MARIS AND CLETE BOYER AFTER WINNING THE 1962 WORLD SERIES-$150. 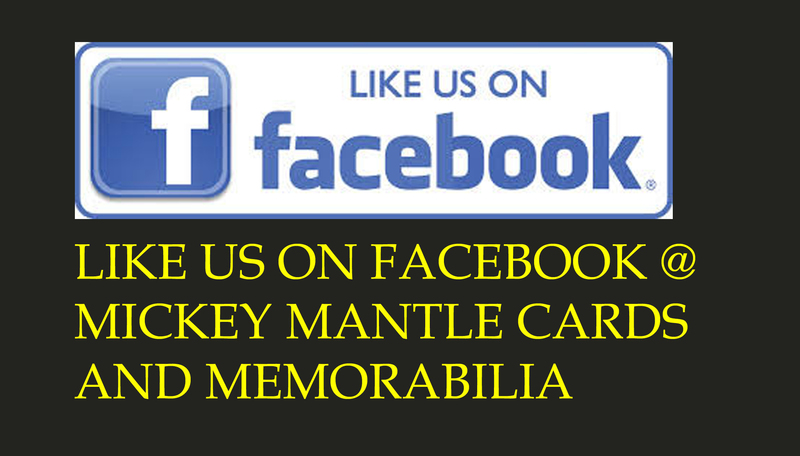 3 1/2" X 7 1/2"
RARE FIRST EDITION BOOK, THE MICKEY MANTLE ALBUM- LOADED WITH PICTURES AND HAS RARE MANTLE ART ON COVER FOUND ONLY ON 1ST EDITION BOOKS- $135. ODDBALL PETE ROSE 12 INCH VINYL PICTURE RECORD DISC WITH FACSIMILE SIGNATURE AND "CHARLIE HUSTLE"- $125. 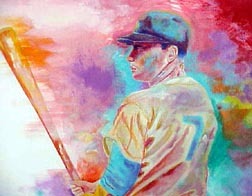 MICKEY MANTLE ORIGINAL ART- 1. APPROX. 22" X 24" ORIGINAL PAINTING BY CLIFF SPOHN. FRAMED AND DOUBLE MATTED- BEAUTIFUL ART PIECE.- $3500. 2. 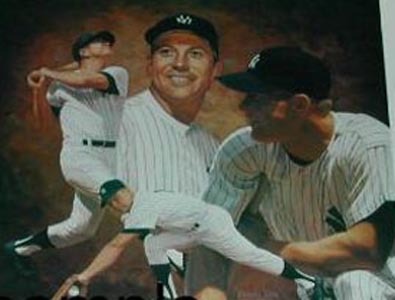 MICKEY MANTLE ORIGINAL WATERCOLOR STANDING TALL IN YANKEE STADIUM- MATTED AND FRAMED, 24" X 30"- $2750. 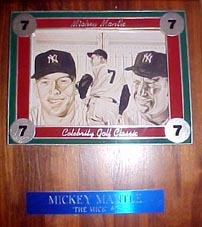 LATE 1950'S/ EARLY 1960'S ORIGINAL STORE FRONT MICKEY MANTLE ART WORK. PAINTED ON WOOD, PAINTING SHOWS AGE, BUT IS IN VERY GOOD CONDITION. PROBABLY A ONE OF A KIND PIECE BY ARTIST MEL STEVENS. -$1275. KELLY R. EISENHAUER, 313 VELVET LANE, LEHIGHTON, PA 18235. 1964 NATIONAL BASEBALL PLAYERS GOLF CHAMPIONSHIP PROGRAM WITH MANTLE, KOUFAX, FORD, DRYSDALE, YOGI BERRA,ETC. EX CONDITION- $25. 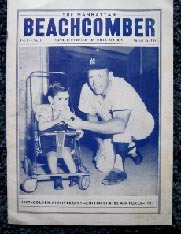 VERY SCARCE 1957 MICKEY MANTLE "THE MANHATTAN BEACHCOMBER" AIR FORCE PUBLICATION.- $125. 1950'S 33 1/3 RPM RECORD- MANTLE AT THE MIKE- VERY RARE-MICKEY INTERVIEWING WARREN SPAHN, YOGI BERRA, LOU BURDETTE, SALLY HEMUS, AND BOB TURLEY. 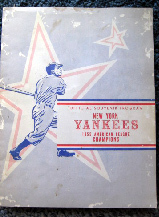 VERY RARE RECORDING-$150, MANTLE AND MARIS MAGAZINE FROM 1961 WITH M&M BOYS CENTERFOLD- $90, AN UNSCORED 1951 SCORECARD- YANKEES VS. WASHINGTON. 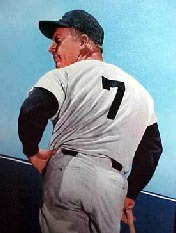 MANTLE WEARING NUMBER 7 ON ROSTER WITH DIMAGGIO, BERRA, RIZZUTO, ETC. A LIGHT SIGNATURE OF WHITEY WITT IS PRESENT- DON'T KNOW IF IT IS LEGIT OR NOT. THE AUTOGARAPH IS VERY LIGHT IN PENCIL- HARDLY NOTICEABLE.- $100. RARE 1955 YANKEES TRIP TO HAWAII PROGRAM WITH MANTLE AND OTHER YANKEES. THIS IS THE PROGRAM BEFORE VISITING JAPAN,ETC. LOADED WITH PICTURES- VG TO EX- $75. 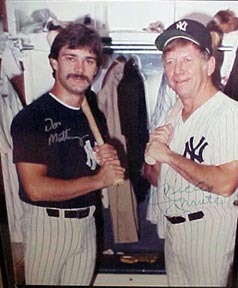 MICKEY MANTLE FUGI REBATE FORM-$20. 1991 MICKEY MANTLE 5 1/2" LOUISVILLE SLUGGER LOMA LINDA CHARITY GOLF PEN IN ORIGINAL PLASTIC-$20. 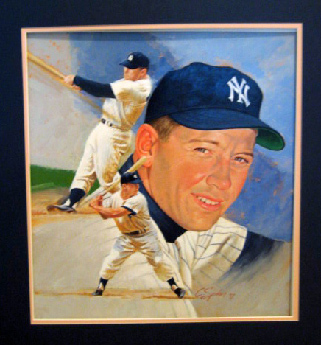 #1 ORIGINAL OIL PAINTING BY ARTIST JAMES AMORE 16 X 20 SHOWING MICKEY MANTLE SWINGING-$1195. #2. 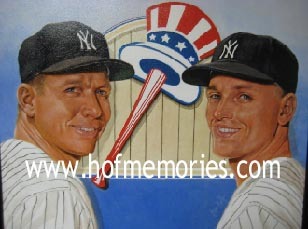 ORIGINAL OIL PAINTING BY ARTIST LEON WOLFE 16 X 20 SHOWING MICKEY MANTLE AND ROGER MARIS- THE M&M BOYS- $1195. .... 1970- 1971 HOUSE OF JAZZ SINGLES- VERY RARE REGIONAL ISSUE -TAKE 10% OFF 2 OR MORE. 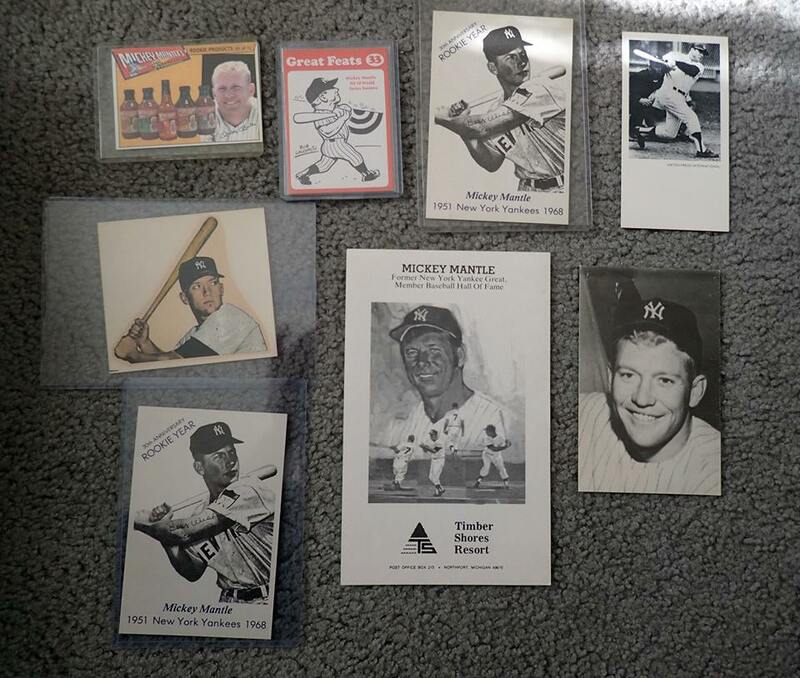 PRICES: MICKEY MANTLE -YANKEES-EX-sold (VERY RARE MANTLE REGIONAL ISSUE), BABE RUTH -YANKEES-$250, JOE DIMAGGIO -YANKEES $250, DUKE SNIDER -BROOKLYN DODGERS-$250, JACKIE ROBINSON -BROOKLYN DODGERS-$250, HANK BAUER -YANKEES-$75, EDDIE LOPAT -YANKEES-$75,BOB LEMON -CLEVELAND INDIANS-$75, BOBBY SCHANTZ -PHILADELPHIA A'S-$75, EARLY WYNN -WHITE SOX-$75, CARL SCHEIB -PHILADELPHIA A'S-$75, BURT SHOTTON- BROOKLYN DODGERS-$50, JOE NUXHALL- REDS-$75, DON NEWCOMBE -REDS-$75, ROY PARTEE -BROOKLYN DODGERS-$65, JOHNNY TEMPLE -CLEVELAND INDIANS-$65, JOHN ANTONELLI -CLEVELAND INDIANS-$65. JUST PURCHASED AND ADDED - ED MATHEWS- $200,RICHIE ASHBURN-$200- WARREN SPAHN-$200,WALT MASTERSON-$50, BURT SHATTON- $50, PEANUTS LOWRY- PHILS- $75, STAN LOPATA- $75, HERMAN FRANKS- $75, AL KALINE with blemish- $100, PHIL MARCHILDON-$50,ROY PARTEE-$55. 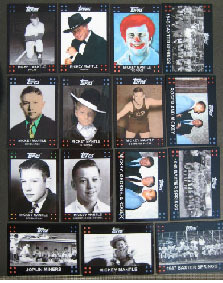 MICKEY MANTLE TOPPS TRIBUTE SET FROM HIS EARLIEST CHILDHOOD DAYS, 3 DIFFERENT BAXTER SPRINGS CARDS, 2 RARE JOPLIN CARDS, MICKEY AT COMMERCE HIGH SCHOOL, GRADUATION PHOTOS, MICKEY AS A CLOWN BEING ROASTED IN BALTIMORE, AND CARDS OF MICKEY,ROGER MARIS, AND GEORGE STEINBRENNER. $135- SOME SINGLES AVAIL AT $15 EACH. THURMAN MUNSON IN MEMORIAM CARD-$20, MANTLE INDUCTION HOF '74 AND B&W ROOKIE CARD-$15 EACH. TWO GREAT DISPLAY BATS WITH CUTOUT BLOCK LETTERS AND BRONZE STATISTICAL PLACKS. 1. 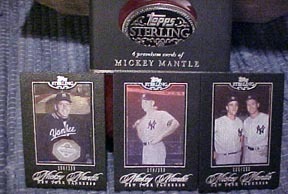 MICKEY MANTLE-$495, MICKEY MANTLE AND ROGER MARIS-$495. 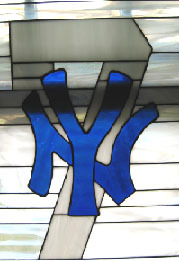 MICKEY MANTLE STAINED GLASS approx. 24 x 14. SHOWS THE YANKEES LOGO WITH NUMBER 7. BEAUTIFUL PIECE THAT COULD BE FRAMED WITH BACK LIGHT.-$400 plus shipping. 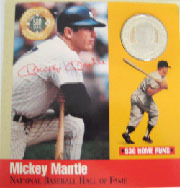 MICKEY MANTLE 500 HOME RUN CARD WITH $25 SILVER DOLLAR COIN ISSUED FROM THE HALL OF FAME.-$65. 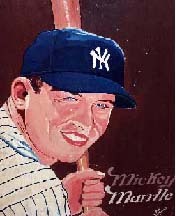 16x20 original MICKEY MANTLE PORTRAIT WATERCOLOR BY JAMES BLISS- $350. Would look great framed for the office. 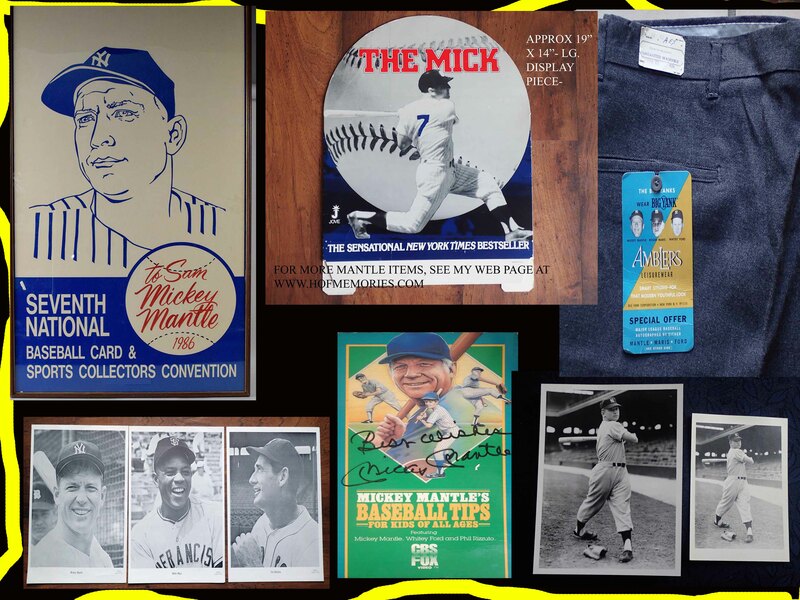 MICKEY MANTLE VARIOUS POSTCARDS INCLUDING RARE TCMA ISSUE-$50,MANTLE BOB PARKER PC-$75 ORANGE HOF PLACK-$75, KIMAC-$15, CONFIDENTIAL MAG CARDS-$20 each, AND MM STORY ERROR CARD-$15. 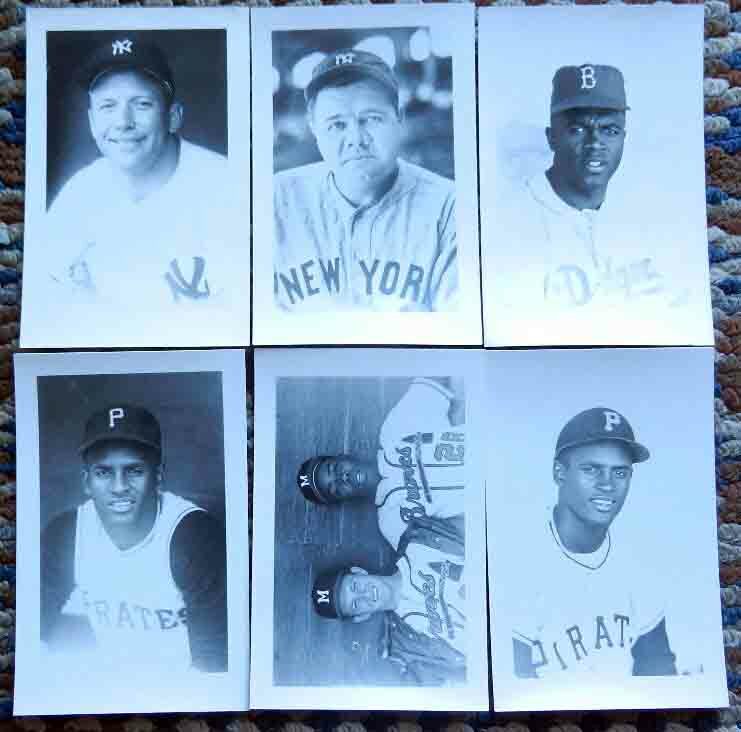 1963 WASHINGTON DC SPORTS PIX SINGLES: ALL NR. 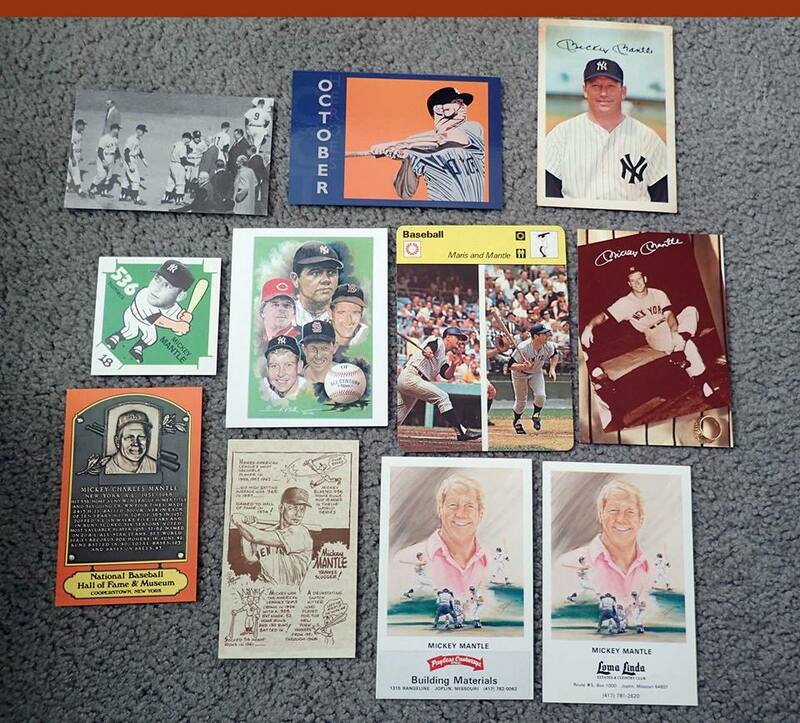 MT CONDITION- ROGER MARIS-$75, BABE RUTH- $35, REMAINING STARS ARE $25 EACH:STAN MUSIAL,LOU GEHRIG, TY COBB, JOE DIMAGGIO. $30EACH: CASEY STENGEL, AND WARREN SPAHN. THE RAREST MICKEY MANTLE BOOK EVER PUBLISHED- 1953 FRENCH CANADIAN BOOK PRINTED IN FRENCH, " LE BASEBALL PAR L'IMGE- HAS CREASE ON FRONT COVER. STILL VERY NICE-$250. 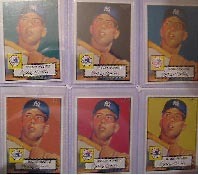 A COMPLETE SET OF ALL 6 1952 MANTLE COLOR VARIATIONS INCLUDING THE RARE SINGLE PRINTED BLUE VARIATON- $90 FOR ALL 6. 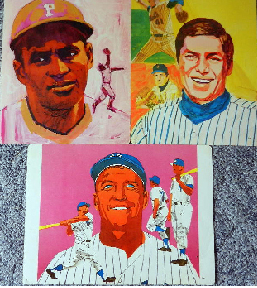 1960's (copies) topps mock art department of prospective designs- $75 for both- no returns. LOT OF MICKEY MANTLE BUTTONS, KNIVES, NICKEL AND MARBLE- EMAIL FOR PRICES. MOST IN $10-$25 RANGE. 4 DIFFERENT late 60's or early 70's MICKEY MANTLE REAL ESTATE ADVERTISING BROCHURES AND PAMPHLETS. 1. 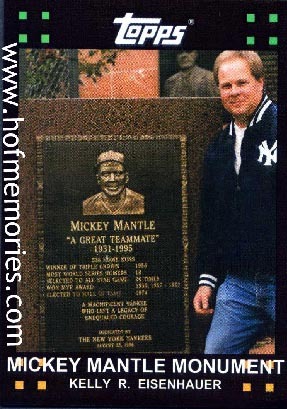 TWO DIFF MANTLE MANORS BROCHURES WITH CARICATURES OF MICKEY-$50ea. 2. MICKEY MANTLE'S NEW WORLD OF WOODS AND WATER- ARBOLADO FOLDER WITH MAP-$50. 3. WILLOWWOOD MOBLIE HOMESITES OF DISTINCTION FOLDOUT- $50. 4.MICKEY MANTLE'S WILLOWWOOD BOOKLET WITH PICTURE ON BACK PAGE (shown with reverse side too)-$50.VERY RARE MANTLE ADVERTISING ITEMS FROM HIS BUSINESS ADVENTURES. 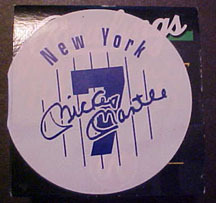 unused MICKEY MANTLE POUND CAKE LABEL-NR. MT. 1 FOR $15 OR 2 UNCUT FOR $25. MICKEY CHARLES MANTLE GEORGIA MEMORIAL SERVICE PROGRAM FROM 1ST UNITED METHODIST CHURCH- $20. MICKEY MANTLE TRUMP PLAZA ROAST CARDS AND COVER ENVELOPE- $100. 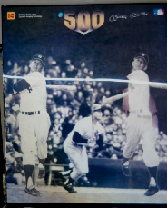 CONTAINS 3 PHOTO CARDS (500TH HR, "THE MICK", & M.M. DAY) AND COMPLETE MINOR LEAGUE AND MAJOR LEAGUE STATISTICS CARD.- EXCELLENT CONDITION. LEON WOLFE 16 X 20 ORIG PAINTINGS OF MICKEY AND CASEY AND 1951 MICKEY- $1500 EACH. 1960's yoo-hoo lot- 2 bottle caps- gil mcdougald-$20, bill skowron-$20, whitey ford-sold. 1960's Bottle label with names on reverse- mickey mantle, ford, berra, skowron, mcdougald,& kubek- $55 . 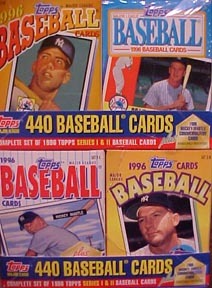 MICKEY MANTLE STORY SERIES 1 AND 2-CONTAINS 30 CARDS- $95. MICKEY MANTLE GOLF FIESTA PLAYING CARD DECK- UNOPENED AND SEALED-SPONCERED BY BRANIFF AIRLINES=$65. 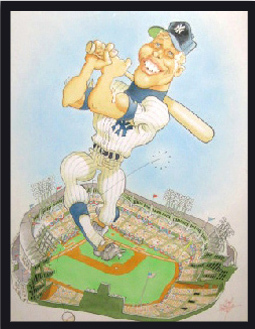 1989 MICKEY MANTLE ARTIST PROOF LITHO FROM HOF SPORTS ARTIST JERRY HERSCH. 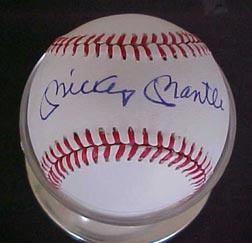 SIGNED IN PERSON BY MANTLE IN 1989. SIGNATURE IS A LITTLE LIGHT, BUT IS ALL THERE AND VERY READABLE AND NOTICEABLE. THE MARKER FADED A LITTLE BIT OVER THE PAST 18 YEARS. 100% AUTHENTIC. WOULD LOOK GREAT IN A DEN OR COLLECTORS ROOM. COMES FRAMED AND MATTED.-$650. GUARANTEED TO PASS PSA/DNA TESTING OR I WILL PAY FEE IF IT FAILS. 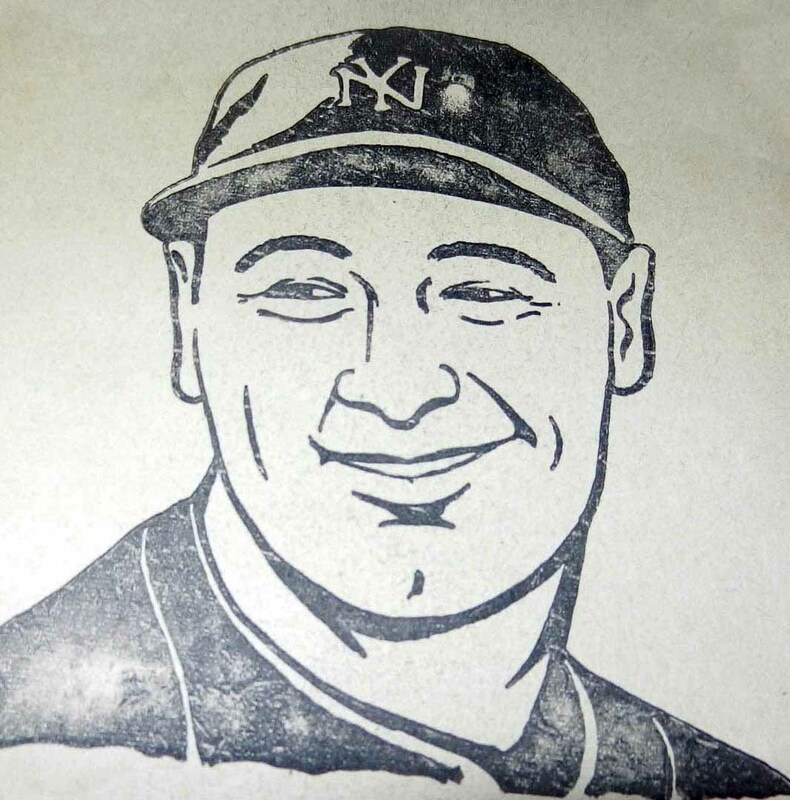 PLEASE SEE 3 ORIGINAL ART DRAWINGS OF MICKEY MANTLE ON NEXT PAGE. 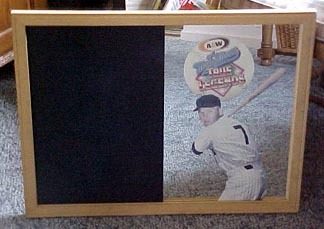 MICKEY MANTLE PROMOTIONAL A & W ROOT BEER MIRROR WITH CHALKBOARD-$300 plus shipping and insurance. 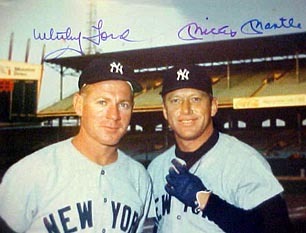 MICKEY MANTLE AND WHITEY FORD AUTOGRAPHED 8 X 10. GUARANTEED TO PASS PNA/DNA TESTING. Comes from original negative- $395. MICKEY MANTLE BATTING TIPS DIE CUT STANDUP DISPLAY WITH PHIL RIZZUTO AND WHITEY FORD. COMPLETE WITH SWEEPSTAKE ENTRY FORMS- $75. 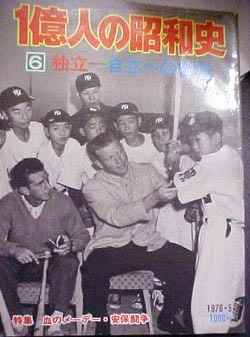 VERY RARE JAPANESE BOOK WITH MICKEY MANTLE AND BILLY MARTIN ON FRONT COVER. ENTIRE BOOK IN JAPANESE. EX CONDITION- $125 PPD. see other mantle japanese book on this page. 1976 BICENTENNIAL ORANGE MICKEY MANTLE HOF PLAK CARD- ONLY MADE 1 YEAR- $50. 1978 LEGENDS OF GOLF BROCHURE WITH MANTLE, DIMAGGIO, RED GRANGE, JOHNNY UNITAS, WILLIE MAYS, BOB HOPE, JACKIE GLEASON, PRES. FORD, ETC. -$25. 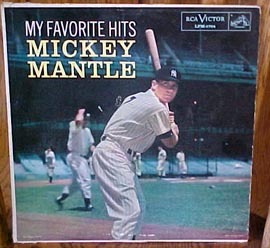 1956 MY FAVORITE HITS MICKEY MANTLE ALBUM - VG- HAS SMALL-SIZED BLEMISH ON FRONT COVER IN BACK AREA OF MICKEY.-$75. 1973 STEADY RECORDS ALL-STAR TIPS CARDS- MAYS-$25, MANTLE-$40, MARIS-$40, KALINE-$20, FORD-$20, KOUFAX-$25, MAZEROSKI-$15, PETE WARD-$10, KEN BOYER-$15, JIM GENTILE-$15, FRANK ROBINSON-$20, DON DRYSDALE-$20. RECORD ALBUM BY ITESELF-$15PPD. 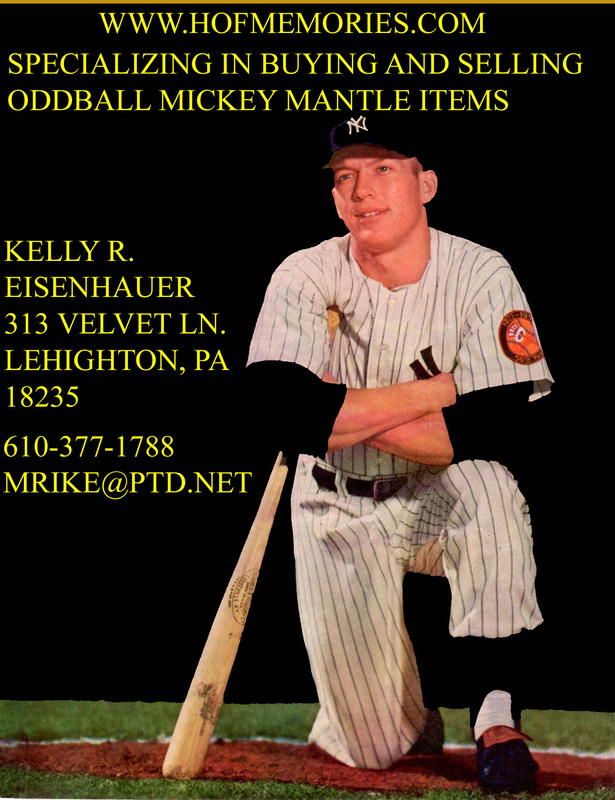 VINTAGE MICKEY MANTLE AFRIN ADVERTISING POSTER. APPROX. 18 X 31. A NEAT COLLECTIBLE THAT WOULD LOOK GREAT FRAMED. A SMALL,PUNCTURE HOLE THAT IS HARDLY NOTEICEABLE & DOES NOT DETRACT FROM POSTER AT ALL.-$135. VERY RARE 1956 MICKEY MANTLE FICTIONAL BOOK- HARD LIBRARY COPY- $125.Copyright problems prevented the "NY" on the yankee hat. The book was eventually pulled and another cover was used. Very rare book. 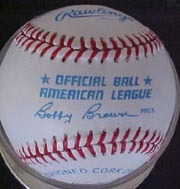 OFFICIAL AMERICAN LEAGUE BOBBY BROWN MICKEY MANTLE AUTOGRAPHED BASEBALL- $1400. GUARANTEED TO PASS PSA/DNA OR JSA TESTING OR I WILL PAY FOR THE AUTHENTIFICATION AND REFUND. 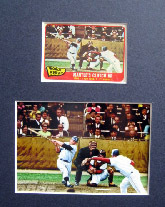 1979 TCMA NEVER RELEASED 1960'S WRAPPER WITH MANTLE, KOUFAX & HANK AARON PICTURED- $75. 1950'S NEVER RELEASED WRAPPER WITH MAYS, DUKE SNIDER, AND WARREN SPAHN PICUTRED-$50. BOTH FOR $100. 1962 MICKEY MANTLE ROGER MARIS SAFE AT HOME SPANISH LOBBY POSTER- $100. UNION NOVELTY POSTCARD SETS THAT INCLUDES ALL 8 diff MANTLE POSTCARDS- PRINTED VERSION- $100, UN-PRINTED VERSION ALSO $100. 1 OF EACH AVAIL. MICKEY MANTLE, BABE RUTH, LOU GEHRIG, AND JOE D UPPERDECK ROOM "CREDIT" CARD FROM HAWAII TRADE SHOW. MANTLE'S LAST CARD FROM UPPERDECK- $45. COMPLETE SET OF 20 MICKEY MANTLE MINI CEREAL BOXES. COMES SHRINK WRAPPED-NO CARDS- $95. MICKEY MANTLE NOVELTY KNIFE WITH FACSIMILIE AUTOGRAPH AND NUMBERED BLADE. -$40. 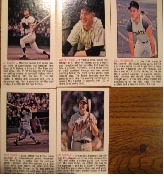 20 some different MICKEY MANTLE MAGAZINE INSERT CARDS SUCH AS CARTWRIGHTS, JOURNAL AMERICAN, INVESTOR'S FOCUS, MARDI GRA, BASEBALL'S FINST, SPORT STARS US, INVESTOR'S JOURNAL, CARDTOONS, FIELD LEGENDS, THE ANALYST, AMERICAN SPORTS, RBI MAG, BALLSTREET, LEGENDS OF THE GAME, U.S LEGENDS,& PRO SPORTS MONTHLY. ALL CARDS ARE $10. 18 X 24 CHAMPIONS OF SPORTS SAMANTHA WENDELL LITHO WITH MICKEY MANTLE, CAL RIPKEN, TROY AIKMAN, MAGIC JOHNSON, JOE NAMATH, AND KAREEM ABDUL JABAR- BEAUTIFUL GLOSSY LOOK- $75 PPD. 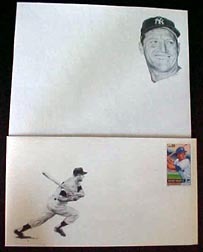 JERRY HIRSCH ARTIST- MICKEY MANTLE PIECE OF PICTURE STATIONARY WITH PICTURE ENVELOPE ADORNED WITH THE NEW MANTLE STAMP- BOTH FOR $50. 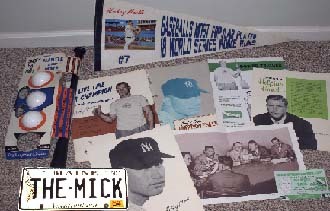 COMPLETE BOX OF MICKEY MANTLE STATIONARY WITH ENVELOPES--$150 . OFFICAL MICKEY MANTLE COMMEMORATIVE RAWLING AMERICAN LEAGUE BASEBALL IN BOX- UNOPENED- $55. 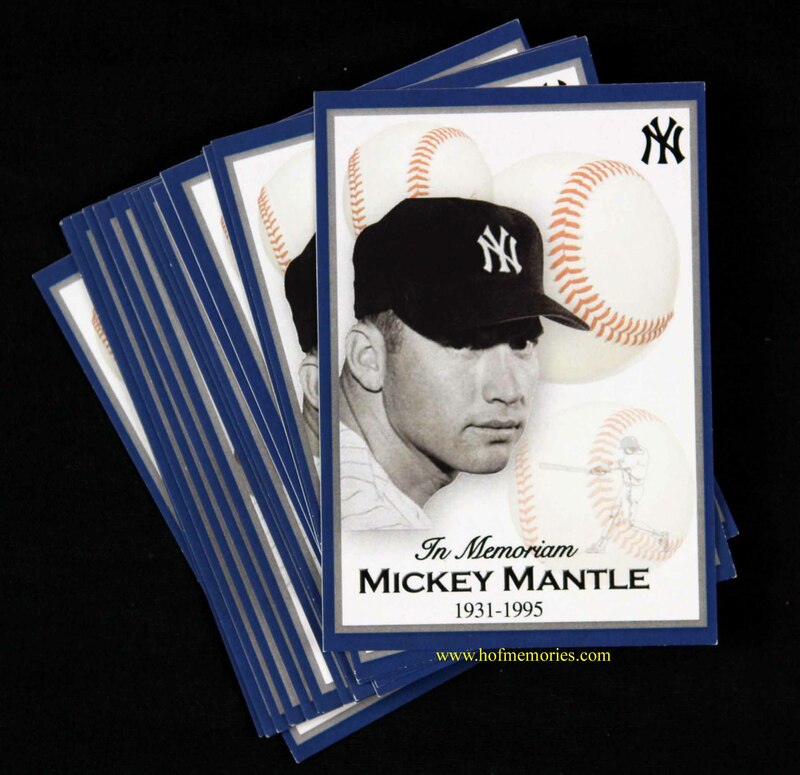 NEW MANTLE TOPPS CARDS: MANTLE FINEST MOMENTS M10 #048/299- $20, FM3 #070/299-$20; FM9- /399- $20; FM1 #305/850- $10,FM8 #638/850-$10, FM9 #301/850-$10, FM10 #792/850-$10, FM13 #075/850-$10, FM16 #126/850-$10, FM 20- #166/850-$10. ALL FINEST MOMENTS ARE PPD. OTHER CARDS: #7 MANTLE CO-SIGNER BASE CARD-$10; CANO/MANTLE SILVER W CREASES- 6/10- $35. WALMART MANTLE WM5-$10,2005-$10, 2004-$10,1996- $10, 2003 MANTLE- $10, 1999-$10, 2000-$10, 2001-$10. 2005 #206 U.D. FLYBALL COMPUTER CARD-$10. ALL 2006 LISTED ABOVE ARE ALSO PPD. 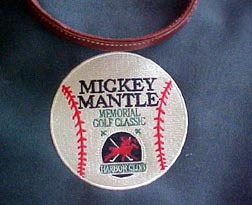 MICKEY MANTLE SHANGRI-LA GOLF CLASSIC PICTURE FRAME FROM HIS CELEBRITY GOLF TOURNAMENT -$135. 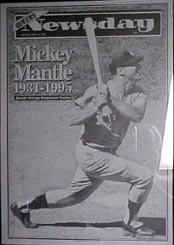 MICKEY MANTLE COMMERCE COMET PROMOTIONAL "POSTCARD" 4 3/4 X 5 3/4 INCHES- $12 PPD. 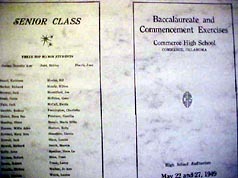 Mickey Mantle Commerce High School 1949 Baccalaureate/Commencement 4 page Program (COPY), not original. no returns.- $15. 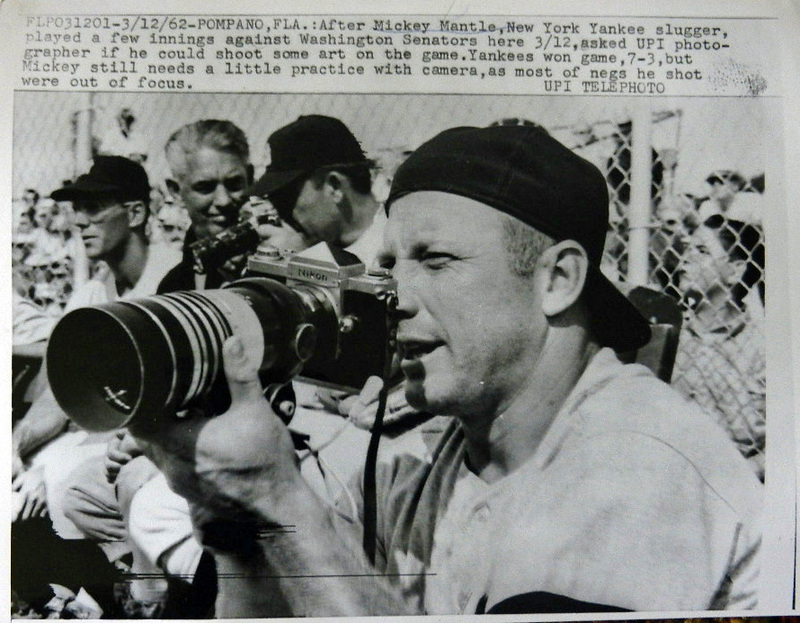 MICKEY MANTLE'S LAST GAME PLAYED HISTORIC PROGRAM. HIS LAST AT BAT AND LAST GAME IS SCORED IN THIS 1968 RED SOX PROGRAM. 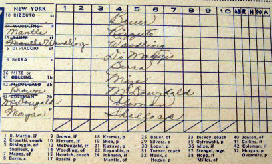 GAME IS SCORED AND BOX SCORE OF GAME ALSO. $250. MICKEY MANTLE OBITUARY NEWSDAY PRINTING Plate FROM NEW YORK NEWSPAPER "NEWSDAY". APPROX. 19.5" X 15.5" - FRAMED- (PICTURE HAS GLARE ON IT. ITEM IS PERFECT. )- $295. 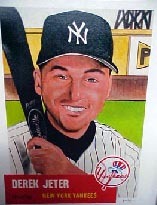 VERY YOUNG 1953 TOPPS format of DEREK JETER ORIGINAL OIL ON CANVAS. 16 X20 AND FRAMED- $450. 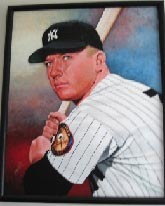 16 x 20 ORIGINAL MICKEY MANTLE ABSTRACT OIL ON CANVAS- FRAMED- $350. 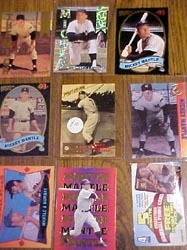 2 DIFF MICKEY MANTLE UNCUT SHOEBOX CARD SHEETS.VERY NICE ITEMS TO FRAME. $125 EACH+ postage. 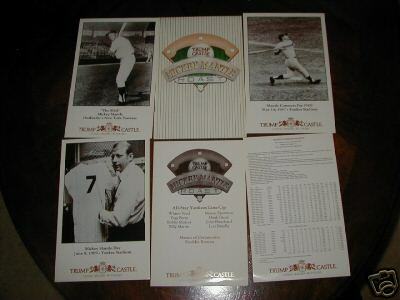 VERY TUFF MICKEY MANTLE TCMA POSTCARD-ALL TIME YANKEE TEAM- $65. 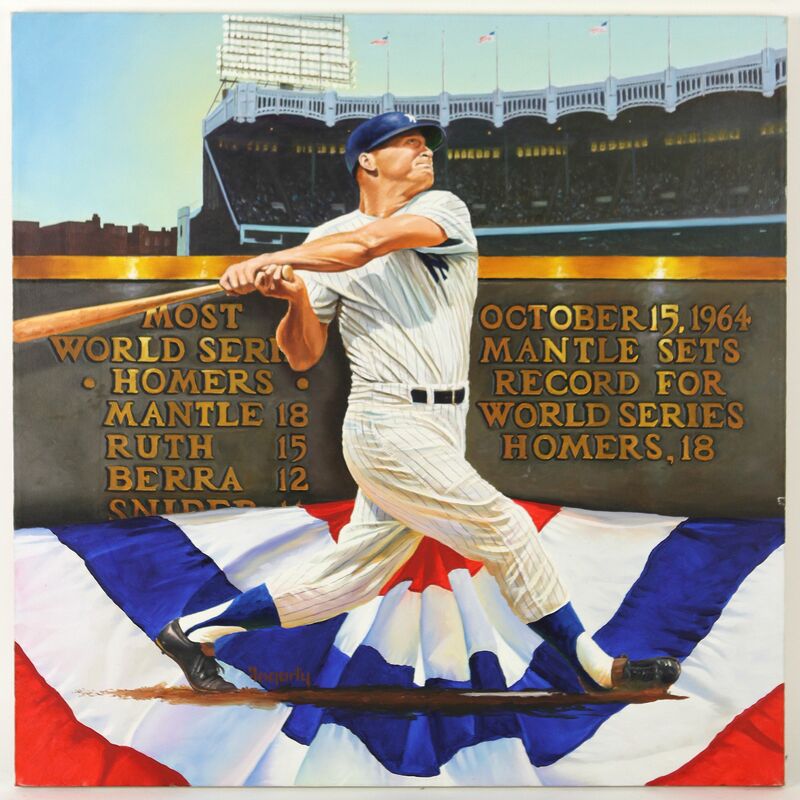 MICKEY MANTLE DANNY DAY LITHO- 22" X 24". A BEAUTIFUL ART PIECE OF THE MICK. COMES ROLLED IN TUBE- $225. PETE ROSE ENDORSED CANCELLED CHECK PAYABLE TO HIM FROM THE NATIONAL PASTIME. CHECK WAS FOR COMPENSATION OF FIRST CLASS AIRFLIGHT TO NEW YORK SHOW. SIGNATURE IN INK ON REVERSE.--EX. CONDITION --$85. 1991 YANKEE LEGENDS AUTOGRAPH SHOW PROGRAM- BACK IN THE DAYS WHEN MICK'S AUTOGRAPH WAS ONLY $10 AND WHITEY WAS $5. EX- NO AUTOS- $65. 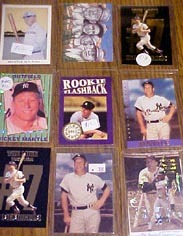 MORE 2006 MICKEY MANTLE TOPPS SINGLES FOR SALE- CHROME REFRACTORS LTD TO 500 OF EACH CARD- ALL $15 HR. 7, 10, 60, 70, 80, 100. BLACK CHROME- LTD TO 200- HR 1, 20, 60- $20. 2006 ORIGINS #125-GREEN-$10, THEN AND NOW MANTLE GIAMBI-$10, NUMBER 1 HOMERUN HISTORY MHR1-$5, U.D 2005 RETRO ROOKIE BASE-$10, BAZOOKA STAMP-$10, MANTLE BASKETBALL CARD- $15. TOPPS #7 SILVER BASE-$10, MANTLE #7 OPENING DAY BLUE FOIL- $15. What Are You Waiting For Click My Button Already!